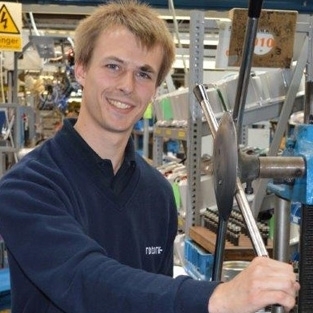 My name is Thomas and I have completed my 4th year of the Technical Apprenticeship scheme at Rotork. I chose this apprenticeship scheme because it allowed me to experience the different aspects of an engineering company. Throughout the scheme I have spent time within different departments such as; Design, Production, Quality, Contracts, Purchasing and others. A main benefit about the scheme is being paid while learning and gaining qualifications. I have gained vital experience within a world leading engineering company. Throughout the apprentice scheme, time is spent working in lots of different departments throughout the company and gaining experience with all aspects of the organisation. The first year of the scheme is in college gaining a PEO (Performing Engineering Operations) qualification and BTEC in Engineering. In the second year, the BTEC in Engineering is carried on with a day release from work. The other four days of the week is spent in various departments throughout the company. During third and fourth year, a HNC qualification in Mechanical and/or Electrical Engineering is taken on. During this time, the apprentice moves around different departments within the company completing various jobs and projects. Once the four years are completed, a job is offered within a department at Rotork. Life within Rotork is a nice and friendly place to work. As an apprentice, we are expected to ask many questions and everyone is more than happy to help you find an answer to help us understand. Many people will put their time out to help us and make sure we are conducting an activity correctly and safety. Throughout my four years I have become more confident, knowledgeable and gained some great friends. I have been offered a job at Rotork and hope to work here for many years to come. I will be looking forward to furthering my qualifications within the company and hopefully gain a HND and eventually degree in the future.